advised by Dr. Jonathan Eisen. I am investigating the taxonomic and functional diversity of seagrass-associated fungi (aka the seagrass mycobiome) locally (Bodega Bay, CA), globally, and between different seagrass species. Laetitia Wilkins and I's paper, "Metagenome-assembled genomes provide new insight into the microbial diversity of two thermal pools in Kamchatka, Russia", is now out! Our recent science communication article, "Even Superheroes Need Help Sometimes: Three Incredible Tales of Microbial Symbiosis", is now available. Frontiers for Young Minds is an awesome journal for kids, reviewed by kids. 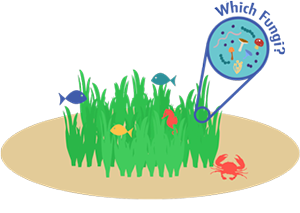 In our paper, "Microbiome succession during ammonification in eelgrass bed sediments", we observed microbial community succession related to sulfur cycling, but could find no correlation between the community and rates of ammonification.